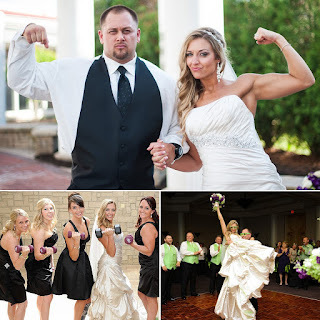 Weddinghousehold.com - Here’s a wedding post for couples who want express their wedding with fitness themed wedding ideas. Celebrating wedding day with sweat session together in the gym is a unique and fun moment. Nothing can replace having a beautiful cake at your wedding. There is a belief that eating the crumbs of the wedding cake would give guests good luck. 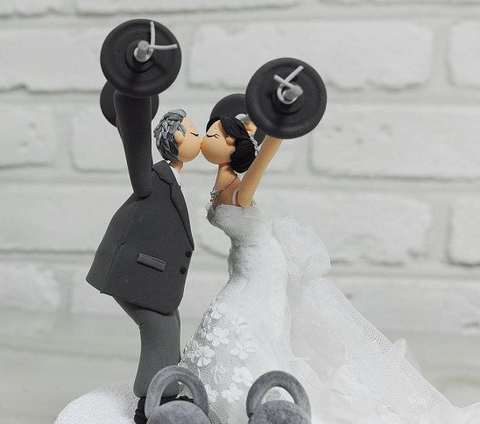 Create a custom wedding cake that is personalized and represents you and your groom as a couple, maybe with a cake topper model of the both of you lifting! Hey, if you’re going to eat cake, make sure it’s a cake that lifts as much as you! You’ve found the perfect dress that shows off your hard-earned physique. Now it comes to dressing your bridesmaids, the girls who make you laugh a little louder, smile a little bigger and have been there with you through the thick and thin, ups and downs, and squats and sun salutations. Dress your girls in chic sports bras or tank tops, with matching sports shoes and an ethereal skirt to exude a sporty feel for an unconventional wedding party. Many couples usually opt to have pre-wedding photos taken before their wedding day. One of the reasons is to get to know your wedding photographer well before the big day so both parties are comfortable with each other. What do you think of the idea of a fitness-themed wedding? Would you ever theme your wedding? Have you ever been to a themed wedding? 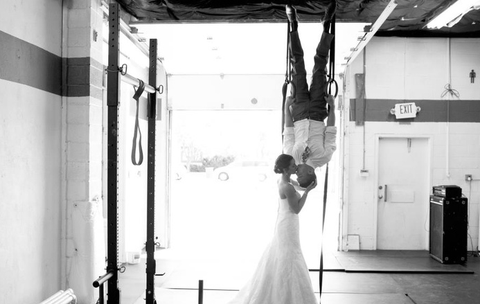 1 Response to "Fitness Themed Wedding Ideas"
The reception is held in the main hall. The Los angeles wedding venues were gorgeous and perfect for a wedding. I have been to several weddings here but it hasn't gotten old. The place is absolutely beautiful and the views are breathtaking.